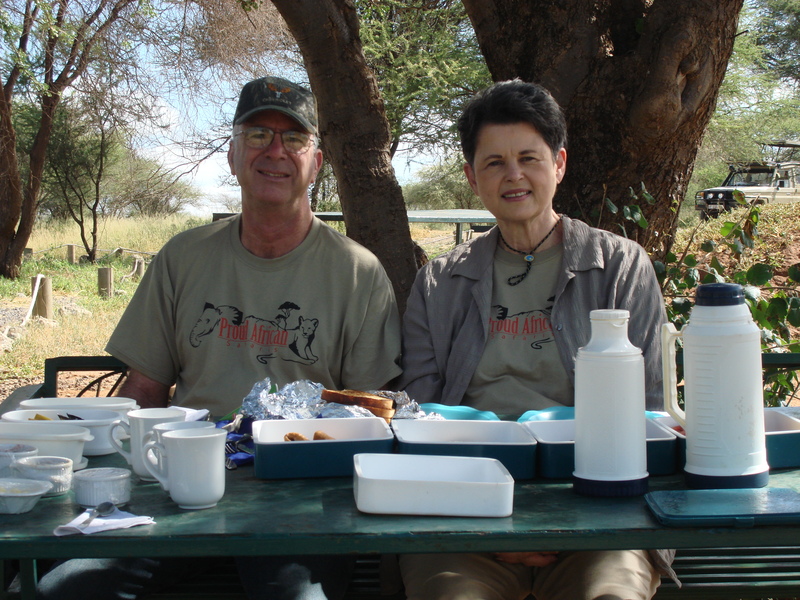 In Tarangire National Park, Tanzania, we were having an awesome African breakfast in a scenic riverside picnic area. Adam, our guide with Proud African Safaris, had just poured our final cup of Tanzanian coffee. Suddenly, Adam grunts “Uhhh” while looking toward the parking lot. Our van in the right back of this photo, and we couldn’t see it. Thinking nothing of his grunt, I continued sipping my coffee and then, slowly headed toward our van to continue our game drive. This van next to us didn’t roll up windows or lower the roof, so he had total access. As we looked inside of our van, we saw Fritos and vanilla cookies scattered everywhere. We had been hit by the American junk food junkie thief. How could this happen, I wondered, when all the doors were locked. We looked up and the roof was wide open! 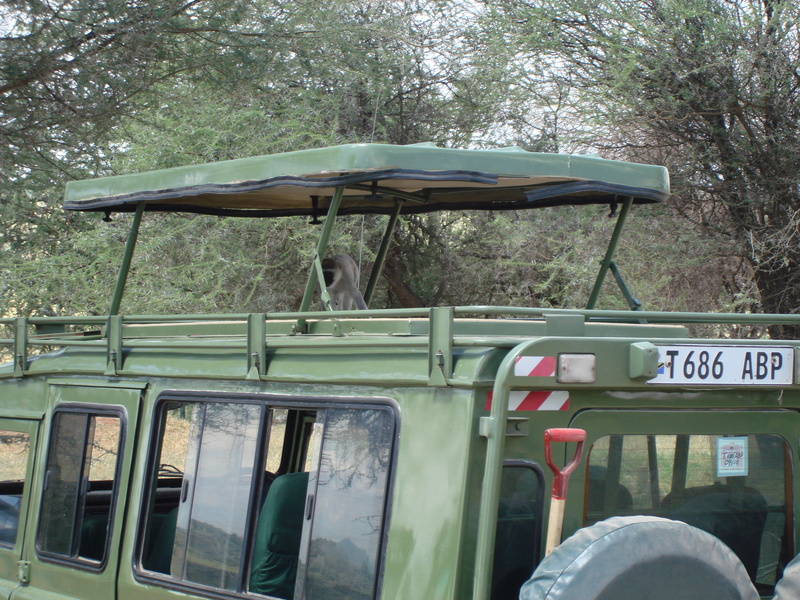 While viewing hundreds of elephants and their babies and other game, we had left it open. Suddenly, the thief jumped straight up through the roof and we realized that we had been robbed by the junk food monkey! That monkey was having breakfast while we were having breakfast. 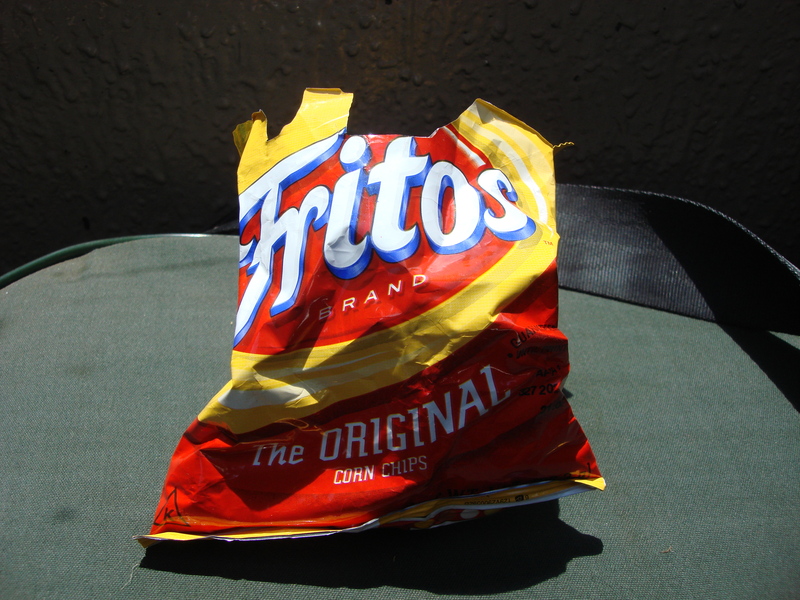 And his dirty little monkey hands rummaged through my tote bag to steal my only bag of Fritos, and vanilla cookies. How lucky I was that he did not bother my medications and other expensive, priceless items. This ia all that was left as the cookies were all gone. Then, we noticed he was going into another van through its roof. Before we could stop him, he jumped into that van and stole a bag of potato chips. Jumping out instantly through the roof, he galloped across the park carrying those potato chips. It was a priceless run of freedom before his next robbery. In that Vervet monkey’s stomach was my Fritos that I had been saving for my stomach when I had an American junk food craving for my favorite snack as I viewed cheetahs, buffalo, lions, rhinos, giraffes, hyenas, hippos, leopards, zebras, elephants and yes, monkeys! What incredible experiences!!! I read all of them, and look forward to more! How fortunate to be able to do this much traveling!